It's not so easy to stay away! I just wanted to put a note up here to let you know why this seemingly stagnant blog is up here. I worked on Booktopia for 3 years, and there are all sorts of reviews within. I am leaving this blog here in the hopes that folks will search the archives for YA and picture book suggestions. Boris and Bella are neighbors in Booville, and they don't exactly get along. Bella is a bit of a mess, and Boris is simply too neat, and neither understands the other. Bella gets the bright idea of having a Halloween party. She invites everyone in town. Everyone, except Boris, that is! When Boris gets wind of this, he decides to throw his own fete, and invites everyone except, you've guessed it, Bella. Well, it turns out that none of the creatures in town want to go to either Boris or Bella's shin-digs. Folks don't want to get bitten by Bella's dust bunnies, and they don't want to be admonished by Boris for scuffing up the floors. Everyone is heading off to Harry Beastie's bash. Both Boris and Bella decide to go to Harry's and give him the what for. Instead, Boris and Bella grudgingly have a good time at the party. After realizing that they are perfectly sized dancing partners, they start to get over their differences. 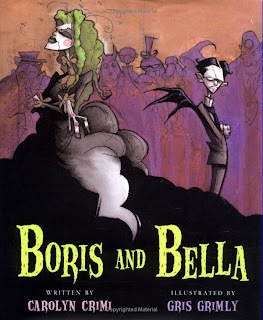 Beautifully illustrated by Gris Grimly (in his spooky way), Carolyn Crimi's Boris and Bella is simply put my favourite Halloween title. I return to it again and again for read alouds at school and at home as well. My best birthday gift was some Grimly art (the last illustration in the book), which my husband then framed with a homemade sculpy Tim Burton-esque black frame. Truth be told, I'm somewhat of a Bella, and he's a bit Boris. So, it is with a bit of a heavy heart that I take this last favourite book post to announce the ending of this here blog. It's been a good run, but I have decided to focus my energy over at "Welcome to my Tweendom". If you would like to follow what I am reading in the realm of picture books and teenlit, friend me over at Goodreads. What could be better than an amusement park? (Well, lots of things if you tend to watch horror movies!). A bunch of kids run happily through the amusement park and are excited to get on the roller coaster. It's a bit scary, but it seems fun enough until the track splits and one car carrying two boys ends up landing in a boiler room of sorts. The boys are pursued by a fat bald man, who chains them to the innards of the rides and sets them to work. While this was happening, a jack-o-lantern finds life once more and convinces a ne'er-do-well clown that he can help the children. A denture flying fight ensues and then the real trippy nature of the book takes over. The park in essence comes alive, and evil meets its match. 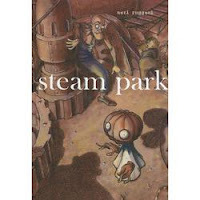 Not technically a Halloween story, this wordless ode to steam punk will have teen readers delighting over the imagery within. Super creepy to this clown-fearin' librarian, fans of Gris Grimly and Burton should approve. Carolyn Crimi is the author of my favourite Halloween picture book, so when I saw that she had a new one out, I was very excited. It's bedtime and Little Baby Mummy is not ready to go to sleep. He wants Big Mama Mummy to play a game of hide and shriek with him. While Mama is doing the dishes, Baby streaks out the door and into the graveyard. After waiting, and waiting for Mama, Baby gets bit worried. Furthermore, he starts to hear some noises. What is that clanking, and wooing? "Mama Mummy, is that you?" calls Baby. Each time it's another creature telling Baby to get back to bed. Bones, Glob, and Drac all tell him to get back home. Baby's not scared...yet. When he really is scared and needs Mama, wouldn't you know it, she shows up. 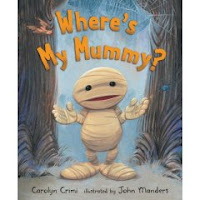 With wonderful rhyming text, Where's My Mummy is sure to become a bedtime favourite. John Manders has created the cutest mummies you ever did see. My own daughters have made this their new request when it's time to tuck in. This makes you smile, doesn't it? It certainly makes me smile. Michael Rex has written a super fun send up of the beloved Goodnight Moon and just in time for Halloween. Instead of bunnies and mittens and mush, readers will delight with a little werewolf, martians and goo. The setting is a tomb of the creepiest sort, and each page offers lots of details to look at. Slimy floors, skeletons, Frankenstein shoes, and big red spiders are sure to delight. A not too scary Halloween read with lots of appeal! I have had a few of these moments as a Children's Librarian over the past 10 or so years. (It never really happened with the YA stuff earlier). I am busily shelving or edging, and a book catches my eye. I pull it off the shelf and low and behold it is a treasure from my childhood. It happened with The Mitten, and more recently with Georgie's Halloween. Georgie is a shy little ghost. So shy that instead of the kind of haunting that you may imagine a ghost would get up to, he simply sticks by his friends Herman the cat and Miss Oliver the owl. Things changed the year that there is a big Halloween celebration on the village green, and Mr. Whittaker (the owner of the house with the attic that Georgie haunted) is to give out a prize for the best costume. Georgie doesn't want to go to the celebration at first, but after he is encouraged by his friends he changes his mind. He is delighted with what he sees in the square, and the children who can see him are so that call out his name, and before Mr. Whittaker can get a glimpse of him, Georgie flies back to the house where he has his haunting routine and is so comfortable. This is a Halloween story of the gentlest sort. 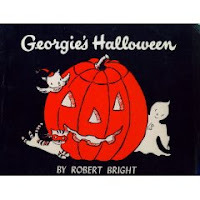 Written in 1958 by Robert Bright, Georgie's Halloween is truly all ages. The black and white colour scheme with simply splashes of orange is so indicative of the time, and a welcome change to the riot of colours in so many of today's books. Tomorrow is the last day to nominate titles for the Cybils award. I am one of the lucky judges for the graphic novels committee, and I would love to have lots of titles to argue over...a-hem...discuss! Head on over to the Cybils to nominate!